South Korean tractor manufacturer Tong Yang Moolsan, more commonly known as TYM has officially inaugurated their new state-of-the-art 32,737m² manufacturing facility in Iksan city, South Korea. Dedicated to the manufacturing and assembly of TYM tractors, rice transplanters and harvesters, the new factory incorporates a 135m long tractor assembly line capable of producing upwards of 16,000 TYM tractors per year. 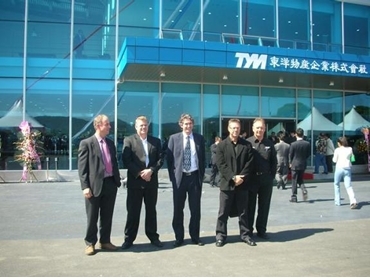 Tractor Imports, the official Australian distributor for TYM tractors was invited to the factory opening ceremony. Special honours went to Mr Colin Wilkinson, the director of Tractor Imports who was invited to take part in the ribbon-cutting ceremony. Tractor Imports was also joined by international delegates from the USA, Japan, China, France and Africa as well as local government officials and TYM employees at the inauguration. TYM produces 19 different tractor models over 6 distinct model series from 23Hp to 100Hp using engines supplied by Mitsubishi and Perkins with a vast range of transmission options. Mr Wilkinson says that the extensive options available in TYM tractors allow them to fit a tractor to a customer’s needs, which results in greater work efficiency and cost-effectiveness. All TYM tractors sold throughout the world come with a 5-year manufacturer’s warranty. Tractor Imports is a specialist importer of tractors for over 20 years and has invested heavily in building a dealer network as well as a large spare parts inventory for all the tractors sold over the past 10 years.